Fantastic waterfront villa you will want to call home immediately! 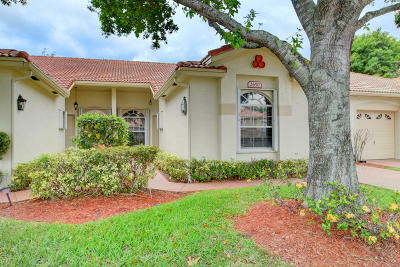 2BR, 2BA, w/garage & A/C'd, glassed in Florida Room that offers lovely SE exposure and amazing lake views. Lovingly maintained by original owner, the open lay out is highlighted by tile floors in living areas, beautiful hardwood in split apart bedrooms,, big eat-in kitchen, vaulted ceilings, & lots of natural light. Roomy master suite offers luxurious bath w/ soaking tub, separate shower, & 2 big closets. Accordion shutters, & pull down stairs for extra attic storage. Monitored alarm system, cable, exterior maintenance, pool, gym, & more included in HOA fee. Community welcomes all ages, & two 25 lb. pets are permitted. Desirable geographic location, close to shopping, beaches, restaurants, highways, airports. HURRY HOME. Listing Courtesy of Invitation Homes, Inc.